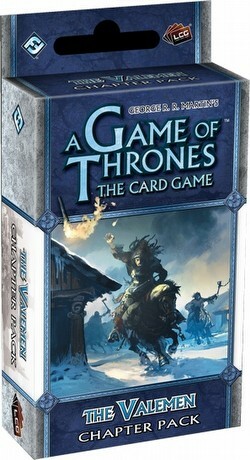 The Valemen is the third Chapter Pack in the Wardens cycle for A Game of Thrones: The Card Game. In the struggle to claim the Iron Throne, even those who wait at the periphery of the struggle can have potent effects on the outcome of your battles and intrigues. The Valemen continues the major themes of the Wardens cycle, enhancing the power of trait-based decks, exploring the powerful "limited response" mechanic, and granting more support for some of the game's most expensive and recognizable characters. You may choose to ride the plains of the Dothraki sea with a horde of Dothraki, defend the Baratheon kings with the Rainbow Guard, or reinforce your walls with the soldiers of House Tully. No matter whom you support in A Game of Thrones: The Card Game, you�ll find the cards you need in The Valemen Chapter Pack. Each pack contains 60 cards (3 each of 20 different cards).